In 1998, The New Press published Remembering Slavery, a book-and-tape set that offered a startling first-person history of slavery. 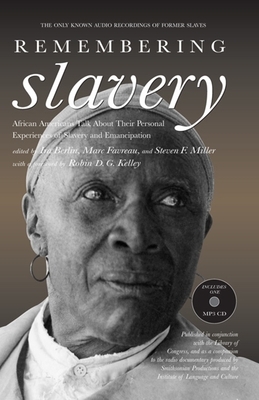 Using excerpts from the thousands of interviews conducted with ex-slaves in the 1930s by researchers working with the Federal Writers' Project, the astonishing audiotapes made available the only known recordings of people who actually experienced enslavement--recordings that had gathered dust in the Library of Congress until they were rendered audible for the first time specifically for this set. Remembering Slavery received the kind of commercial attention seldom accorded projects of this nature--nationwide critical and review coverage as well as extensive coverage on prime-time television, including Good Morning America, Nightline, CBS Sunday Morning, and CNN. The tapes have been aired repeatedly on public radio stations across the country. Reviewers called the set "chilling ... and] riveting" (Publishers Weekly) and "something, truly, truly new" (The Village Voice). *The audio for this new edition is on MP3 compact discs. MP3 audio books on compact disc can be played on newer CD players that support MP3 technology and accept a 4.75"-diameter disc and on any personal computer that has Microsoft's Media Player or similar software.